You are here: Home / Blog / Main Dishes / Spring Roll Noodle Bowl = Crazy Good! 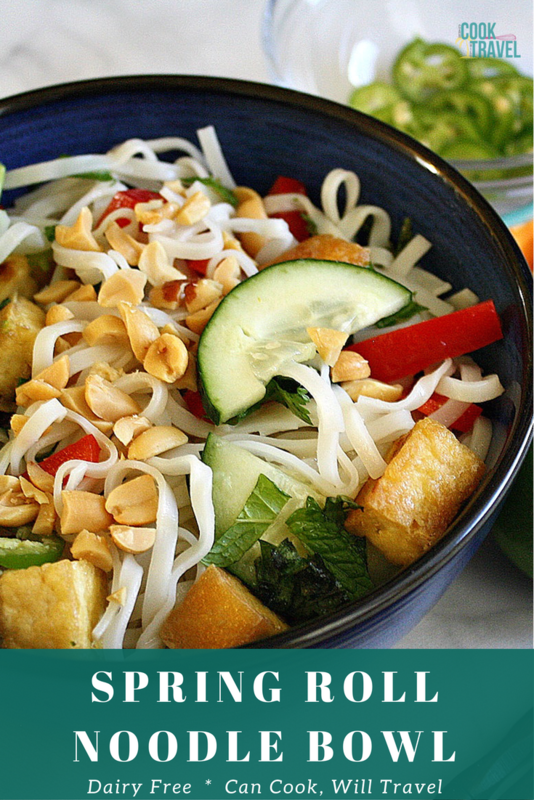 Spring Roll Noodle Bowl = Crazy Good! You guys, it’s almost Spring, and how exciting is that?! So in honor of the upcoming season, it seemed like the perfect time to try out this delicious looking Spring Roll Noodle Bowl from Pinch of Yum. It really was the right thing to do. I’m all about eating healthy bowls these days. I’m still drooling over last year’s Buddha Bowl and last month’s stellar Turmeric Sweet Potato Bowl (also thanks to Pinch of Yum). 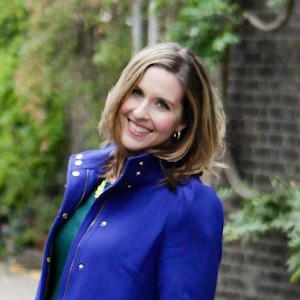 And can we talk about how much I’m loving that blog, by the way? They know their flavors and cook super healthy food that’s usually dairy free, so I naturally keep finding my way back to their recipes. There are a few components to this dish. First you have the rice noodles, and then the garlic lime dressing. Add in your favorite veggies and proteins and you’re in for a serious treat! 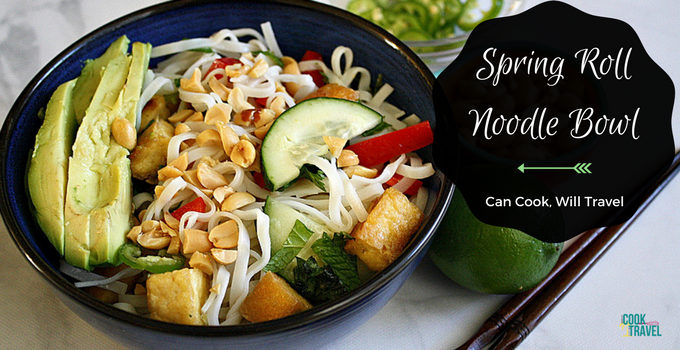 Parts of this Spring Roll Noodle Bowl can be made ahead, which is always a good thing in my book. You can prep your veggies ahead of time, and I did that by slicing my cucumbers, serrano pepper, and julienning my bell pepper. You can really throw in whatever veggies you like, but these worked so well. I’d also recommend making your protein ahead of time, too, so that you can quickly throw the dish together. You can skip the protein, but I think it definitely adds a little extra oomph to the dish. I went with a crispy tofu for mine, because I loved it so much with my Buddha Bowl. But I could see grilled chicken or shrimp working very well too in the Spring Roll Noodle Bowl. Let’s talk rice noodles first. I’d previously cooked with rice noodles but this recipe suggested cooking them slightly differently. First you soak the noodles in cool water for at least 30 minutes so that the noodles start to soften. And then cook them in boiling water for a minute or two, so that the noodles don’t get so sticky. And it worked like a charm, I must say! Finally it’s time to talk dressing. It’s super simple to make in your blender. You’ll just combine vegetable oil, fish sauce, agave, rice vinegar, lime juice, and garlic together and dressing is done! It’s bright, slightly sweet, and isn’t heavy at all. Just don’t you dare go smelling your fish sauce or you’ll have second thoughts about using it. Once the noodles are cooked, just toss them with the dressing, veggies, some fresh herbs, and your protein. We need to chat about the herbs for a moment, because they really help make this dish. The recipe encourages you to use basil, mint, AND cilantro and I 100% agree with this. They work so well together, and the mint adds this delicious, clean flavor. The herbs get minced and tossed into the noodles and you’ll find that they brighten up each bite you take. Then top with chopped peanuts and half of a sliced avocado and you’re ready to eat. I love the crunch of the veggies, added texture from the tofu and some chopped peanuts. The noodles have such wonderful bite to them, and the dressing and fresh herbs take it over the edge and wake up the dish. With a little creaminess from the avocados, this dish is really well balanced. Now if you want a little heat, definitely add in a few slices of serrano pepper, but you can leave it out if you want. Or I think a jalapeño pepper would be great too. 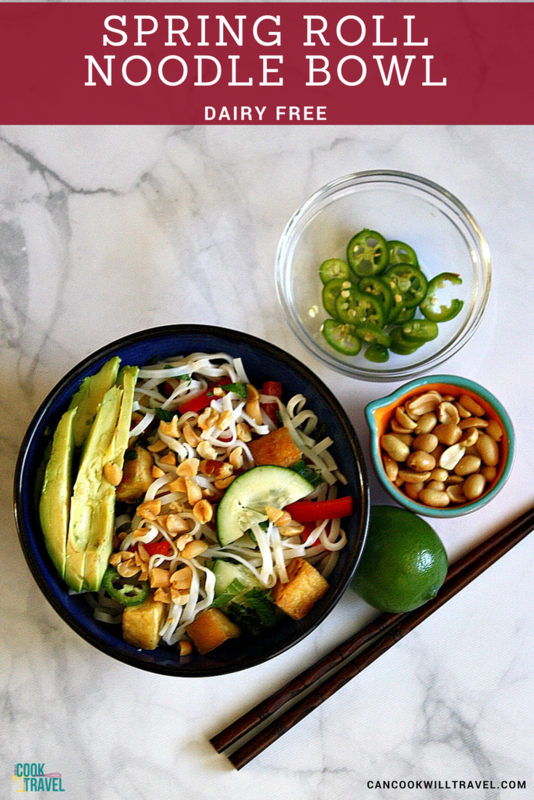 I couldn’t be happier with how delicious this Spring Roll Noodle Bowl recipe is. It’s fast and easy to make, and bright and fresh. I know I’ll be making this one for a good portion of this year, because it’s exciting and delicious and perfect for beating the heat. So run, don’t walk, to the grocery store and pick up everything you need for a Spring Roll Noodle Bowl of your very own. Click that link for the recipe and step by step instructions. You won’t regret it! One year ago: Irish Nachos – Just in Time for St. Patty’s Day! Three years ago: Baked Avocados Are So Cool!! Four years ago: Irish Coffee Brownies – A Very Happy St. Patrick’s Day! Five years ago: Spaghetti Squash is so Cool! Six years ago: Happy St. Patrick’s Day! Bring on the Guinness!